ITSLIQUID International Contest offers participating artists a wide range of opportunities and prizes specifically chosen to promote the selected artists and enhance their careers. The winners will be selected by a Jury of renowned Art, Architecture, Design and Fashion experts, following the criteria of quality of the work, originality, uniqueness, and the Public vote. The Jurors' vote will award for one or more categories 3 selected artists for 1 YEAR Art professional renowned Art Gallery representation in Venice, Bogotá, Buenos Aires; 1 selected artist for 1 YEAR participation in International Art Exhibitions in Venice, New York City, Bogotá, Buenos Aires; artists selected for 16 Contemporary Art Exhibitions in Venice, New York City, Bogotà, Buenos Aires and in other prestigious venues and art galleries all over the world scheduled by ITSLIQUID GROUP events' program; 30 artists selected for featured articles on the ITSLIQUID platform. The Public vote will select the winner of a featured article on the international magazine ArtStyle. SUMBIT NOW YOUR WORKS to ITSLIQUID International Contest! For THE FIRST PRIZE 3 artists selected by ITSLIQUID GROUP in collaboration with the related Gallery Manager, will be awarded 1 YEAR professional renowned Art Gallery representation! The artists will be inserted in the Galleries official artists' list and his/her artworks will be shared and presented for a whole year to collectors, art critics, curators, dealers, and introduce the artist in the galleries' network in Venice (THE ROOM Contemporary Art Space), Bogotá (Jorge Jurado Art Gallery), Buenos Aires (Laura Haber Gallery). 1 of the winner artists will be awarded with 1 year of participation in ITSLIQUID Exhibitions in Venice, New York City, Bogotá, Buenos Aires! Since its beginning, ITSLIQUID GROUP has organized more than 250 events all around the world, involving more than 5,000 artists, in more than 60 international venues. ITSLIQUID works with a number of national and international galleries as well as publishers, museums, curators and writers from all over the world. 10 of the winners of the ITSLIQUID International Contest will take part in one International Contemporary Art Exhibition in Venice, in the one exclusive location like THE ROOM Contemporary Art Space and other prestigious venues and historical buildings. Among the last contemporary art events realized in Venice by ITSLIQUID GROUP, the festival BORDERS, during the period of the 15th Venice Architecture Biennale 2016, ANIMA MUNDI FESTIVAL during the period of the 57th Venice Art Biennale 2017 and SURFACES FESTIVAL, during the period of the BIENNALE ARCHITETTURA 2018 – 16th International Architecture Exhibition, that involved more than 600 selected artists and architects coming from more than 40 countries with more than 1.000 works exhibited. 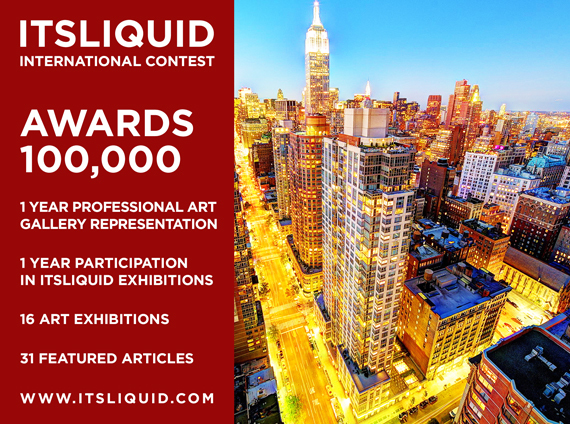 2 winners of the ITSLIQUID International Contest will be exhibited in New York City the most influential city for Contemporary Art! One of the winners will be presented in next ITSLIQUID Limousine Festival! Among the last contemporary art events realized in New York City by ITSLIQUID GROUP, the Liquid Cities NYC – International Video Art Limousine Festival, presented in a very experimental art space: a limousine. At the end of the Limousine Festival, all selected videos has been screened at the XY Atelier Contemporary Art Gallery, from the 25th to the 28th of the October 2015. 2 winners will take part in a Contemporary Art Exhibitions in Bogotá, at Jorge Jurado Gallery. Due to its dynamic art scene, directly connected to New York, London, and Berlin, Bogotá transformed into an important destination of the international art circuit, one of the best Contemporary Art Places of South America! Among the last contemporary art events realized in Bogotá at Jorge Jurado Gallery, the exhibition OXYGEN – FRAGMENTED CITIES+IDENTITIES 2016, ALCHEMIC BODY | FIRE . AIR . WATER . EARTH 2017, in which has been presented more than 40 works of important and emerging artists, coming from more than 30 nations. 2 winners will take part in a Contemporary Art Exhibitions in Buenos Aires, at Laura Haber Gallery. Laura Haber Gallery in Buenos Aires is directed by curator Laura Haber and it is one of the most renewed galleries of Argentina! Among the last contemporary art events realized in Buenos Aires at Laura Haber Gallery, the exhibition ALCHEMIC BODY | FIRE . AIR . WATER . EARTH 2017, in which has been presented more than 60 works of important and emerging artists, coming from more than 40 nations. 30 artists will be interviewed and published on the official platform of ITSLIQUID GROUP! The 3 best artists of all the 10 categories win a featured article on ITSLIQUID platform and the email announcement sent to the mailing list dedicated with more than 200,000 qualified subscribers. Among them architects, designers, artists, collectors, art critics, curators, dealers, and other personalities of the International art, architecture, design and fashion world. 1 artist selected by the public will be published on the prestigious international review ArtStyle! Art Style is the art magazine distributed in 25.000 copies in the most relevant location for Contemporary Art, in art fairs and art galleries in Cortina d'Ampezzo, Rome, Milan, Venice, Ibiza, London, Miami. The magazine deals with the most important international Art events, and is particular focused on Art, Architecture, Design, Luxury and Fashion.